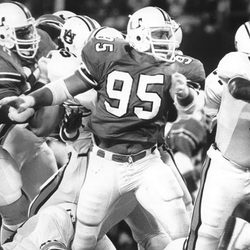 Kevin Fagan's five-year career at Miami began in 1981 when he entered the University as a 200-pound linebacker/defensive end to finishing his collegiate career in 1985 as one of the toughest defensive players ever to come out of Coral Gables. Kevin, who lettered from 1983-85 and grew to approximately 260 pounds, won a national title with the team in his first season as a starter in 1983 and would go on to assist UM in getting to New Year's Day bowl games in 1984 and 1985, as well. In his first varsity season in 1983 he led the team in downs played during a crucial stretch of 11 straight games en route to the program's first National Championship with a 31-30 victory over Nebraska in the 1984 Orange Bowl Classic. In that Nebraska game, Kevin hauled down quarterback Turner Gill twice while recording nine tackles. His second season in 1984 saw the dominant lineman play in all 12 games while receiving double and triple blocks the entire year. Fagan would still go on to lead the team in tackles for loss and sacks in guiding the Hurricanes to the Fiesta Bowl. A fourth-round pick by San Francisco in 1986, Kevin would go on to play eight seasons with the 49er's until his retirement in 1993. Kevin's 49er's would also win back-to-back World titles in Super Bowls XXIII and XXIV.